Dog aggression is a very complex topic. 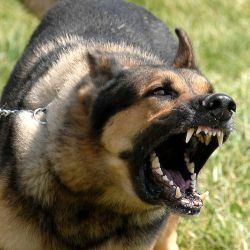 Dog aggression, simplistically defined, is any behavior that makes you afraid a dog is going to bite someone or something. Again, that’s an over-simplified description, but aggressive behavior basically attempts to increase the distance between the aggressor and the target of its behavior, such as a person or another dog. The good news is I think we can help you. It could take weeks, months, or even longer to resolve the aggressive behavior. However, if you’re committed to helping your dog — if you’re committed to our program — then I think we can help you improve your dog’s behavior. A puppy that jumps on people or nips with its razor-sharp teeth is not usually being aggressive. A dog that lunges on a leash or plays roughly with other dogs is usually not being aggressive. However, we can certainly help you with these undesirable behaviors, too. If you have a dog that bites or threatens to bite, call us today! Not tomorrow, not next week – call us TODAY! Please read our article on growling and snarling TODAY! Stop ALL physical “nasties” to your dog IMMEDIATELY! NO CHOKE COLLARS, PINCH COLLARS, OR SHOCK COLLARS!!! If possible, remove the aggressive dog first. Remove the target of the aggression next (a person or another dog). Keep the aggressor and the target of the aggression separated. The good news is I think we can help you with your dog’s aggressive behavior if you’re willing to put in a lot of time, patience, work, boring repetition, and COMMITMENT on your part. It could take weeks, months, or even longer to resolve the behavior. There are NO GUARANTEES because there are just too many variables involved. Does that mean we’re going to keep our hand in your wallet the rest of your dog’s life? Absolutely not. That’s the beauty of our “3+1″ packages. With each package, you purchase three one-hour sessions, PLUS you get the fourth hour absolutely free! You’re not paying thousands of dollars for a “lifetime guarantee” that really doesn’t mean anything and that you never use. With our program, you purchase only the packages that you need and want. Typically, the first four sessions are a week or two apart. Subsequent sessions are typically 4 to 6 weeks apart to give you more time to practice the very important exercises. The exercises may be boringly repetitive, but you MUST do them if you want to help your dog. Remember — you MUST be committed to making retraining your dog AND yourselves a success. If you’re committed, then we’ll be committed right along with you. We go to your home and train the entire family to act appropriately around the dog. And you know what happens? The dog starts to behave a lot better as a result. We recommend that everyone in your home attend our training sessions in your home. We REQUIRE that everyone who has been snapped at or bitten by your dog attend our sessions. We will show everyone how to (1) remove the reward of the aggressive behavior and (2) teach the dog the behaviors you want it to do instead. The price of our services will depend on what part of town you live in. Give us your ZIP code, and we can quote you an exact price. Our most popular package is our “3+1”. With it you purchase three 1-hour sessions, and you get a fourth hour absolutely free! Also, if you’re within our service area, there’s no extra charge for travel time. Our training calendar fills up very quickly, especially in the evenings. Call us TODAY to book your appointments. We can help!